On his 26th day of hunger strike, hunger-striking Palestinian prisoner Bilal Kayed will be transferred to hospital within the next several hours following a sharp deterioration in his health condition, reported Addameer Prisoner Support and Human Rights Association. Kayed rejects all medical examinations, salt supplements or vitamins and is only consuming water. Prior to his transfer to hospital he has been held in Ashkelon prison in solitary confinement in a small 1.5 x 2 meter cell with no windows and denied access to a fan in the mid-July summer heat. He has only been permitted access to lukewarm tap water from the sink in his cell. He launched his hunger strike on 15 June after being ordered to six months’ administrative detention, imprisonment without charge or trial, immediately upon the expiration of his 14.5 year sentence in Israeli prisons on 13 June. He is one of nearly 750 Palestinians held without charge or trial on the basis of secret evidence, under indefinitely renewable administrative detention orders. He – and fellow Palestinian prisoners – fear that this attempts to set a new precedent of indefinitely imprisoning Palestinians after the expiration of lengthy prison sentences. Hundreds of fellow Palestinian prisoners are supporting Kayed’s strike, demanding his freedom. Palestinian prisoners affiliated with the leftist Popular Front for the Liberation of Palestine, Kayed’s party, are engaged in a series of protest and hunger strike actions throughout Israeli prisons, demanding his freedom – they announced their steps of protest for July in a statement released on Friday, 8 July. Support for Kayed from imprisoned Palestinians crosses political lines – former prisoner Allam Kaabi stated to Asra Voice radio that the prisoners affiliated with Islamic Jihad and Hamas have expressed their support for joining the program of protest actions for freedom for Kayed. Kayed’s comrades issued a statement on Sunday, 10 July, warning against incorrect or misleading media reports in the Palestinian and Arabic-language media regarding legal visits and ongoing negotiations in Kayed’s case, urging that the only lawyers authorized to speak officially on behalf of Kayed in Palestine are those from Addameer, and the only political body that can speak on behalf of the striking prisoners is the PFLP’s prison branch. Kayed’s move to hospital also comes amid the beginning of an international week of action in solidarity with his strike, demanding his freedom, from 8-15 July. 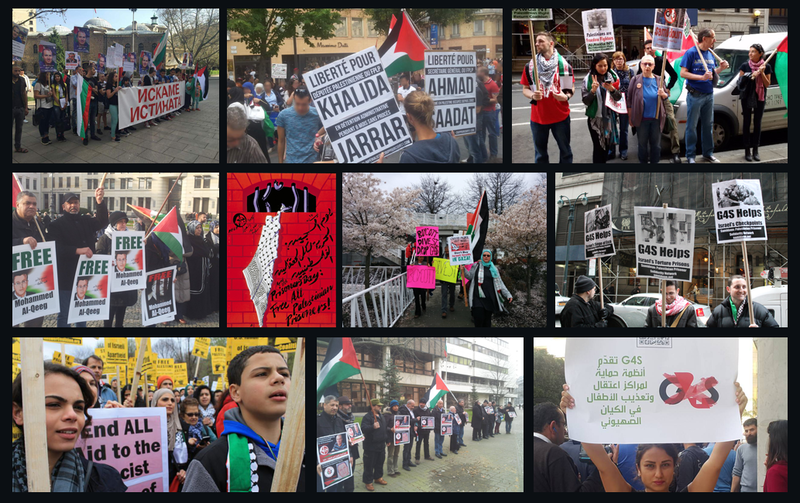 Over 170 international organizations joined the call for Kayed’s release, and many cities around the world held events on 24 and 25 June in support of Kayed and his fellow Palestinian prisoners. On Saturday, 9 July, protesters in Manchester marched to commemorate the second anniversary of the 2014 Israeli attack on Gaza, demanding justice for Gaza and all of Palestine, and freedom for Bilal Kayed and his fellow 7,000 Palestinian political prisoners in Israeli jails. Participants occupied a Barclays Bank branch in Manchester over the bank’s investment in the Israeli arms trade, including Elbit Systems. Also on 9 July, eirigi activists in Enniscorthy, Wexford, Ireland, gathered to protest outside the offices of TD Paul Kehoe, Minister for Defence, protesting his participation in a NATO conference and the Irish government’s continuing arms deals with the Israeli state. The Irish republican socialists expressed their solidarity with Palestinian prisoners, posting photos of Kayed on the windows of Kehoe’s office. At the same time, Italian activists began a “relay fast” for Kayed, from 9-16 July, with participants engaging in daily hunger strikes to demand Kayed’s freedom. Tampa, Florida activists are also engaged in ongoing daily hunger strikes to demand Kayed’s freedom. Protests took place on Friday, 8 July in New York; Naples; Tampa; Arklow, Ireland; and London. Forthcoming events and protests demanding Kayed’s freedom are scheduled to take place in Milan, Beirut, New York City, Haifa, and Berlin.